At first I thought it was a little weird that DC Collectibles’ Arrow series didn’t make a Laurel figure — but I’m kind of glad they waited. Instead of a “Laurel Lance, DA, with hamfisted pill addiction plotline action!” toy getting made, we’re getting an awesome Black Canary version of her. Yay! Revealed in a Facebook video that is an incredibly loose recap of Arrow’s first three seasons that I’ve yet to decide if its charmingly low-budget or just flat out awful, which culminates in a recreation of the first scene Laurel takes on the Canary role following her sister Sara’s exit. 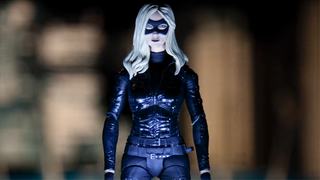 The Laurel figure is part of DC Collectible’s growing female presence in their Arrow toys, recently bolstered by the presence of the ever delightful Felicity Smoak. Considering she’s now a part of Team Arrow properly, it’s nice to see her getting some representation in the line. Shame she doesn’t seem to come with her recently upgraded Canary Cry gadget. No other details were revealed so we don’t quite know when Laurel will arrive, but expect DC to release a bit more info soon.